Tourism in Morocco is well developed, with a strong tourist industry focused on the country's coast, culture, and history. Morocco has been one of the most politically stable countries in North Africa, which has allowed tourism to develop. The Moroccan government created a Ministry of Tourism in 1985. Tourism is considered as one of the main foreign exchange sources in Morocco and since 2013 it had the highest number of arrivals out of the countries Africa.. In 2018, 12.3 million tourists were reported to have visited Morocco. In the second half of the 1980s and the early 1990s, between 1 and 1.5 million Europeans visited Morocco. Most of these visitors were French or Spanish, with about 100,000 each from Britain, Germany, and the Netherlands. Tourists mostly visited large beach resorts along the Atlantic coast, particularly Agadir. About 20,000 people from Saudi Arabia visited, some of whom bought holiday homes. Receipts from tourism fell by 16.5% in 1990, the year the Gulf War began. In 1994, Algeria closed its border with Morocco after the Marrakech attack, which caused the number of Algerian visitors to fall considerably; there were 70,000 visitors in 1994 and 13,000 in 1995, compared to 1.66 million in 1992 and 1.28 million in 1993. In 2017, there were 10.3 million tourist arrivals, compared with about 10.1 million in 2016, a 1.5% year over year increase. 30% of the tourists were one of the 3.8 million Moroccans living abroad. Marrakech itself had over 2 million visitors in 2017. Most of the visitors to Morocco continue to be European, with French and Spanish nationals making up almost 40% of all visitors. Most Europeans visit in April and the autumn, apart from the Spanish, who mostly visit in June and August. Tourist receipts in 2007 totaled US$7.55 billion. Tourism is the second largest foreign exchange earner in Morocco, after the phosphate industry. The Moroccan government is heavily investing in tourism development. A new tourism strategy called Vision 2010 was developed after the accession of King Mohammed VI in 1999. The government has targeted that Morocco will have 10 million visitors by 2010, with the hope that tourism will then have risen to 20% of GDP. A large government sponsored marketing campaigns to attract tourists advertised Morocco as a cheap and exotic, yet safe, place for European tourists. Morocco's relatively high number of tourists has been aided by its location, tourist attractions, and relatively low price. Cruise ships visit the ports of Casablanca and Tangier. Morocco is close to Europe and attracts visitors to its beaches. Because of its proximity to Spain, tourists in southern Spain's coastal areas take one- to three-day trips to Morocco. Marrakesh and Agadir are the top two destinations in the country. Air services between Morocco and Algeria have been established, many Algerians have gone to Morocco to shop and visit family and friends. 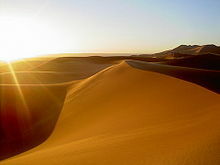 Morocco is relatively inexpensive because of the devaluation of the dirham and the increase of hotel prices in Spain. Morocco has an excellent road and rail infrastructure that links the major cities and tourist destinations with ports and cities with international airports. Low-cost airlines offer cheap flights to the country. The "Plan Azur", is a large-scale project initiated by King Mohammed VI, is meant to internationalise Morocco. The plan provides for creating six coastal resorts for holiday-home owners and tourists (five on the Atlantic coast and one on the Mediterranean), the daily telegraph noted. The plan also includes other large-scale development projects such as upgrading regional airports to attract budget airlines, and building new train and road links. Thus, the country achieved an 11% percent rise in tourism in the first five months of 2008 compared with the same period last year, it said, adding that French visitors topped the list with 927,000 followed by Spaniards (587,000) and Britons (141,000). Morocco, which is close to Europe, has a mix of culture and the exotic that makes it popular with Europeans buying holiday homes. Fez - Morocco's second largest city and it is the science and spiritual capital of Morocco. It contains an old area which is considered as the biggest area in the world where vehicles can't get in. It is also the home of "Al Qarawyien" the world's oldest university. While Morocco was a French Protectorate (from 1912 to 1956) tourism was focused on urban areas such as the Mediterranean cities of Tangier and Casablanca. Tangier attracted many writers, such as Edith Wharton, Jack Kerouac, Paul Bowles, and William S. Burroughs. There was a period of beach resort development at places such as Agadir on the Atlantic coast in the 1970s and 1980s. Tourism is increasingly focused on Morocco's culture, such as its ancient cities. The modern tourist industry capitalizes on Morocco's ancient Roman and Islamic sites, and on its landscape and cultural history. 60% of Morocco's tourists visit for its culture and heritage. Agadir is a major coastal resort and has a third of all Moroccan bed nights. It is a base for tours to the Atlas Mountains. 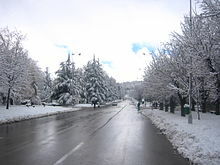 Other resorts in north Morocco are also very popular. Casablanca is the major cruise port in Morocco, and has the best developed market for tourists in Morocco. Morocco is home to nine UNESCO World Heritage Sites. (ii), (iii), (iv), (vi) 7005420000000000000♠42 (100) 1997 The important Roman outpost of Volubilis was founded in the 3rd century BCE to become the capital of Mauritania. It contained many buildings, the remains of which have survived extensively to this day. The Bou Inania Madrasa built by the Marinid sultan Abu Inan Faris in 1351. Fez was the capital city of modern Morocco until 1925 and is now the capital of the Fès-Meknès administrative region. The city has two old medina quarters, the larger of which is Fes el Bali. It is listed as a World Heritage Site and is believed to be one of the world's largest urban pedestrian zones (car-free areas). University of Al Quaraouiyine, founded in 859, is the oldest continuously functioning university in the world. The city has been called the "Mecca of the West" and the "Athens of Africa", a nickname it shares with Cyrene in Libya. Marrakech in central Morocco is a popular tourist destination, but is more popular among tourists for one- and two-day excursions that provide a taste of Morocco's history and culture. The Majorelle botanical garden in Marrakech is a popular tourist attraction. It was bought by the fashion designer Yves Saint-Laurent and Pierre Bergé in 1980. Their presence in the city helped to boost the city's profile as a tourist destination. Tangier, formerly the International Zone from 1923-1956, is a city in north of Morocco. Formerly part of the Spanish Protectorate in Morocco, Tangier is a blend of Spanish, Moroccan, and Berber cultures. Famous tourist sites in the city and near it include the Tangier-American Legation, Hercules Cave, the Kasbah museum, the Perdicaris Parc, the Musée de Carmen-Macein, Museum of Moroccan Arts and Antiquities, Museum of Contemporary Art, the Grand Socco, the Petit Socco, and Gran Teatro Cervantes. El Jadida, formerly called Mazagan by the Portuguese, was registered as a UNESCO World Heritage Site in 2004, on the basis of its status as an "outstanding example of the interchange of influences between European and Moroccan cultures" and as an "early example of the realisation of the Renaissance ideals integrated with Portuguese construction technology". According to UNESCO, the most important buildings from the Portuguese period are the cistern, and the Manueline Church of the Assumption. El Jadida is also home to the annual Salon du Cheval–the largest horse expo in Africa. Despite the April 2011 terrorist attacks in Marrakesh and the murder of 2 Scandinavian tourists in Imlil December 2018, Morocco continues to be touted as safe country in which to travel. ^ Hudman, Lloyd E.; Jackson, Richard H. (2003). Geography of Travel & Tourism. Cengage Learning. ISBN 0766832562. ^ a b Bazza, Tarek (2019-01-23). "Over 12 Million Tourists Visited Morocco in 2018, Up 8% from 2017". Morocco World News. Retrieved 2019-03-21. ^ "Inspiring a tourism revolution in Morocco". www.worldfinance.com. Retrieved 2019-03-21. ^ a b c Hudman, Lloyd E. (2002). Geography of Travel & Tourism. Thomson Delmar Learning. p. 367. ISBN 0-7668-3256-2. ^ Museyon (2009-06-01). Film + Travel Asia, Oceania, Africa: Traveling the World Through Your Favorite Movies. Museyon. ISBN 9781938450341. ^ "You're Not a World Traveler Until You Visit these UNESCO sites". pastemagazine.com. Retrieved 2017-11-22. ^ Planet, Lonely. "Aït Benhaddou travel - Lonely Planet". Lonely Planet. Retrieved 2017-11-22. ^ Gilbert, Sarah (2017-07-25). "Fez's medina gets new riads, restaurants and restored monuments". The Guardian. ISSN 0261-3077. Retrieved 2017-11-22. ^ a b c d Shackley, Myra (2006). Atlas of Travel And Tourism Development. Butterworth-Heinemann. pp. 43–44. ISBN 0-7506-6348-0. ^ a b The Middle East and North Africa 2003. Europa Publications, Routledge. 2002. p. 863. ISBN 1-85743-132-4. ^ "Medina of Fez". UNESCO. Retrieved 28 May 2010. ^ "Medina of Marrakesh". UNESCO. Retrieved 28 May 2010. ^ "Ksar of Ait-Ben-Haddou". UNESCO. Retrieved 28 May 2010. ^ "Historic City of Meknes". UNESCO. Retrieved 28 May 2010. ^ "Archaeological Site of Volubilis". UNESCO. Retrieved 28 May 2010. ^ "Medina of Tétouan (formerly known as Titawin)". UNESCO. Retrieved 28 May 2010. ^ "Medina of Essaouira (formerly Mogador)". UNESCO. Retrieved 28 May 2010. ^ "Portuguese City of Mazagan (El Jadida)". UNESCO. Retrieved 28 May 2010. ^ "Rabat, modern capital and historic city: a shared heritage". UNESCO. Retrieved 30 June 2012. ^ Reuters (2008-06-11). "Yves Saint Laurent's Ashes Scattered In Marrakesh". The New York Times. Retrieved 2008-06-14. ^ "Portuguese City of Mazagan (El Jadida) - UNESCO World Heritage Centre". Whc.unesco.org. Retrieved 2013-02-10. ^ "Le Salon du Cheval d'El Jadida: 11 ans déjà!". 2M (in French). Retrieved 2019-03-21. ^ Kasraoui, Safaa (2018-12-19). "Tourism in Morocco: High Occupancy Rates Despite Murders of 2 Tourists". Morocco World News. Retrieved 2019-03-21. 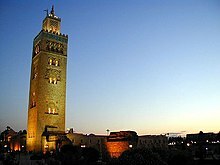 Wikivoyage has a travel guide for Morocco.